Finding a way to repurpose an item is not an easy task. I did not really have any luck or inspiration looking in thrift shops, and I think it was my own fault. Because the Squishy Circuits are based on the concept of electricity, I kept looking for ways to motor something or power an object, which really is the purpose for the product. So, on my way to lunch with a friend, I tried to take the project off my mind completely. Searching so intensely, was definitely not working. Walking downtown Galway, you see a number of interesting things going on. Street performers, people handing out brochures, singers, guitar players. These people catch my eye, and on this Saturday it was a group of men singing in particular. They were dressed in what I assume to be traditional clothing, and appeared to have a very deep sense of unity and joy. That quickly linked to my desire for an increased sense of community and culture in my classroom. The clothing they wore was something they had in common, yet it was creative and unique to the group, a passerby would know they belonged together. I then began to think about the idea of a class mascot or even table group mascots in my classroom. The creation of these mascots works under many levels of content and will coincide with a piece of ASFM’s mission for creating a safe and caring school. 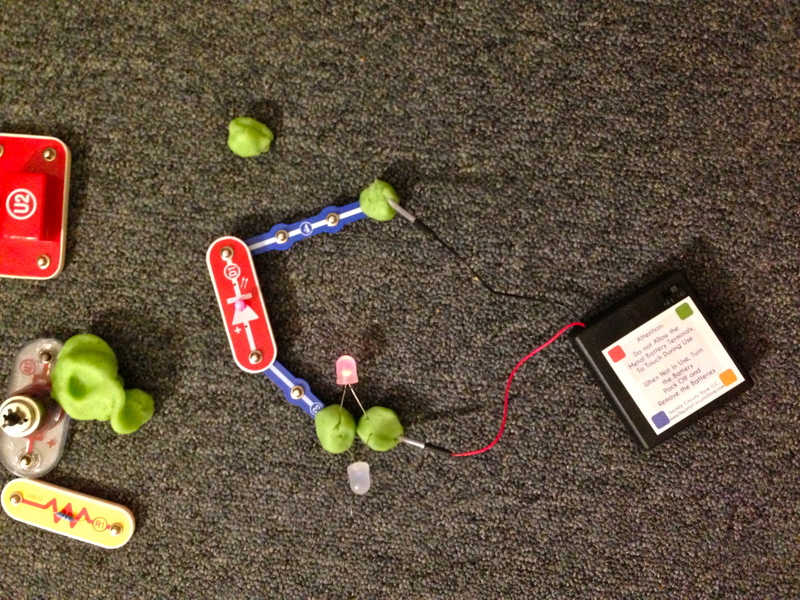 The electricity unit in fourth grade covers circuits, therefore as the unit culminates, students will have the chance to transfer their knowledge of using batteries, wires, and light bulbs to the play dough and Squishy Circuits. Creativity, collaboration, and critical thinking will also play a role in this activity as students will need to derive a mascot that represents the 20+ students and many different cultures that make up the classroom. The planning and collaboration will be key, as students will utilize their content knowledge, while working to create the mascot which will bring them together as a class. I have seen a few pictures of work done by Squishy Circuits for the creation of different objects- but I feel the repurposing of this technological tool, to be used for creating a culture of caring and inclusion within a classroom takes the product to a new purpose. This weekend I worked a bit on mixing different tools together to try and create a switch that might make the turning of these mascots on and off more accessible and easier to manage. There was some success and some failure, but in the end, I felt excited at the thought of sharing this idea with my next group of students- and turning them loose on the idea. However, I do realize I need to make a prototype for this- and that will be my next step. Creating something of my own to use as a model. This will prove interesting, as I test my own content knowledge and critical thinking skills.